Imagine that you are taking a quiet stroll through the South American rainforest at sunset, which is kind of sketchy as it is. You hear a strange clacking sound, and as you fumble for your flashlight to illuminate what appears to be a small mammal crawling on a log, your flashlight beam lights up a spider. A spider the size of a puppy. 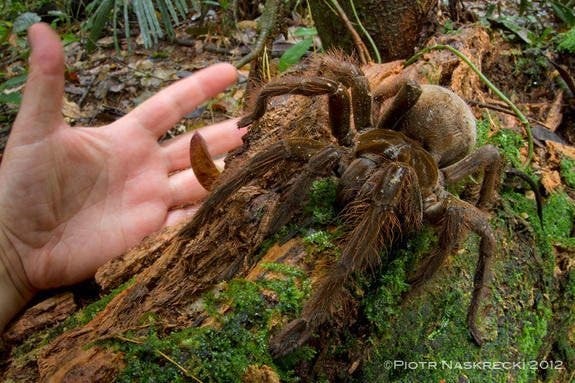 That is exactly what happened to Piotr Naskrecki in the rainforests of Guyana when he came across the South American Goliath birdeater, which is the largest spider in the world. Naskrecki, an entomologist and photographer at Harvard University’s Museum of Comparative Zoology said, “When I turned on the light, I couldn’t quite understand what I was seeing.” It’s not every day that you see a spider the size of a small dog. When Naskrecki first approached the spider it began rubbing its rear legs against its body. As “cute” as Naskrecki thought the behavior was, in reality it was creating a cloud of microscopic hairs that have hooked barbs on the end of them. If these hairs were to get in your eyes, nose or other bodily opening, they are “extremely painful and itchy.” Yeah, that’s adorable. If the cloud of barbed hairs wasn’t reason enough to run away from this spider like you’d run away from a ticking time bomb, don’t forget the fact that it has 2-inch-long fangs that deliver a venomous bite. The venom isn’t deadly to humans, but it would be about the same as driving a nail through your hand.